This attractive, beige-brick apartment building was erected in 1912 and converted to a cooperative in 1988. 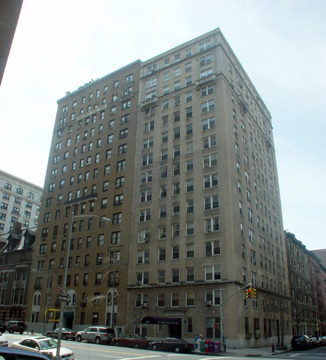 The 15-story building was designed by George F. Pelham and has 62 apartments. The buff-colored brick building has a dumbbell-shaped plan with light courts opening to the north and south. The building has a concierge, a step-up lobby and consistent fenestration. It permits protruding air-conditioners and has no landscaping, no garage and no sundeck. It has a short canopy. It is in a very attractive stretch of West End Avenue and is only a block to the east from Riverside Park and a block to the west from convenient neighborhood shopping along Broadway. Crosstown bus service and a subway station are at 96th Street and Broadway. The building was erected on the site of five stone-fronted, five-story rowhouses. The original eight-over-one wood sash windows have been replaced by dark greay aluminum one-over-one sash.